Join the movement to boycott companies who support the NRA. Also - until Amazon & Fedex discontinue NRA discount, you can a) cancel your Amazon Prime memberships and b) call to FedEx to tell them you are switching to UPS and USPS. Amazon continues to offer the NRA TV app, allowing anyone with a Fire TV or certain game controllers to watch the NRA’s television channel, despite calls from high-profile activists to drop the content. Everytown and Moms Demand Action, two gun safety groups, joined forces to launch a campaign Friday demanding that streaming services stop offering NRA TV. “NRA TV is home to the NRA’s most dangerous and violence-inciting propaganda,” Moms Demand Action founder Shannon Watts said in a statement. “It’s time for tech leaders to acknowledge their role in helping the NRA spread this dangerous content and cut it out.” A Change.org petition also aims to get NRA TV pulled from Amazon in particular. Clearent, a credit card processing company, offers “firearms friendly” services geared toward NRA members. A representative did not immediately respond to a request for comment. The NRA TV app is also available on Apple TV. The company did not immediately respond to a request for comment. 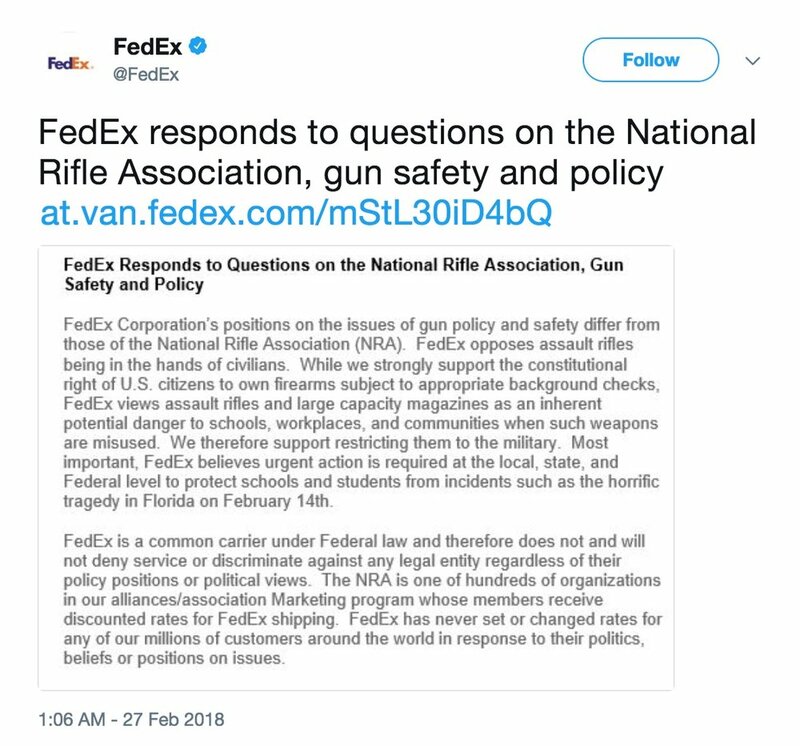 FEDEX gives discounts to NRA members and is sticking with this relationship. Go HERE if you want call them. NRA TV is also available through Google’s Chromecast. The company did not immediately respond to a request for comment. The preventative health company based in Austin, Texas says on a NRA-specific website that members can “take advantage of affordable discounts.” A representative did not immediately respond to a request for comment Tuesday. Members are encouraged to protect their “privacy and financial security” through a subscription to this privacy protection service, though no discount is specified. A representative did not immediately respond to a request for comment Tuesday. The NRA-endorsed term life company is listed as providing “higher coverage amounts” for members on life insurance policies. A representative did not immediately respond to a request for comment Tuesday. Members are invited to purchase health insurance plans through eHealth’s exchange, though no specific discount is specified. A representative did not immediately respond to a request for comment Tuesday. The hotel booking company lets NRA members book trips through a website only accessible with a member number. Tim Hentschel, co-founder of Hotel Planner, told Bloomberg that it would not be distancing itself from the gun lobby. “Our company provides discounted rooms to several large associations, including the NRA,” he said. “These associations greatly benefit our customers by buying discounted rooms from groups that might otherwise be charged a penalty by hotels for not using all of the rooms in their block.” A representative for Hotel Planner did not immediately respond to requests for comment. The wine company operates “the official wine club of the NRA,” offering NRA members an “exclusive first-time offer” of “4 exceptional wines for just $29.99,” which it says is a savings of over $84. Vinesse also sells “NRA Collector’s Series” packages of wine. A representative for the company did not immediately respond to a request for comment. In the past 48 hours, these companies have ended their relationship with the NRA. Tweet to thank them.